Top: Romwe c/o | Jeans: Forever 21 also here | Heels: Old similar here, here, here and here | Bag: Target | Sunglasses: Quay Australia cheaper versions here and here | Lipstick: MAC in "Creme Cup"
The weather is finally cooling off and I am so excited to be able to wear long sleeves and booties. This top is just the cutest. 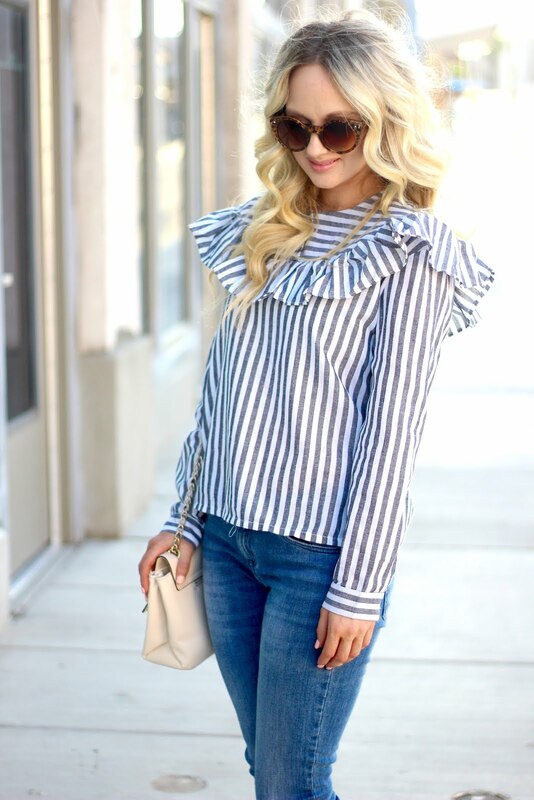 The frill top across the chest just gives it a bit for feminine feel to a basic striped top. It also looks super cute tucked in with some chunky heels. The best part is it is only $12! Just be sure to size up.